Born on the shores of Lake Michigan, Chicago represents the pride of the Midwest. Whether you’re on the hunt for authentic deep-dish pizza, unrivalled architecture, or intricately curated museums, the city caters to all cultural tastes. Stroll along the Riverwalk and hold onto your hat; it is the Windy City, after all. One of Chicago’s finest collections, the Art Institute of Chicago is the second-largest art museum in the country. With works by Cassatt, van Gogh, and Picasso inside, it is easy to lose track of time around here. Perhaps one of the most notable works is American Gothic, the iconic piece depicting rural Midwestern characters, inspired by Flemish Renaissance Art. No matter your tastes, this first-class museum caters to them all. In a tribute to The Wizard of Oz, Oz Park, nestled within Lincoln Park, is home to “Dorothy’s Playlot” (playground for the little ones), and the “Emerald Garden” (an oasis of flowers). Visitors will recognize the statues of the famed Oz characters, each of them etched in bronze. Take a stroll through and be transported back to childhood—there’s no place like home. The Chicago Cultural Center (the former city library) houses an incredible Tiffany dome. The dome, which is nearly 38 feet in diameter, is made up of over 30,000 individual pieces of glass. The rest of the building is entrenched in opulence—walk its marble staircases and read the golden quotes that line the walls. A lesser-known (and free) attraction, this piece of architectural history is not to be ignored. 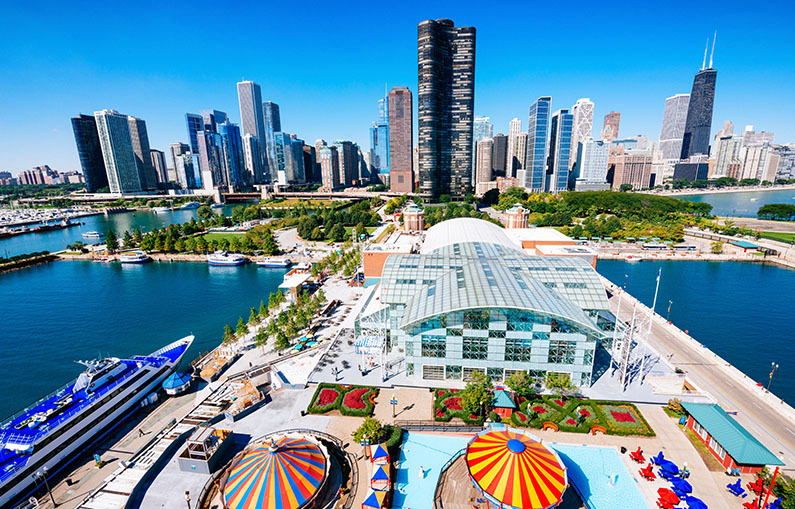 Reminiscent of classic Americana, Navy Pier is a nonstop carnival of family-friendly fun. Take the Water Taxi over and spend a few hours, making sure to keep a free hand for a funnel cake (or cotton candy, or a corn dog, or what have you). This is the place for kitschy souvenirs, ferris wheel rides, and bumper cars; it is the place to take your kids or reconnect with your inner child. To plan your trip to Chicago or for an extended guide of things to do, visit the official Chicago city guide at http://www.cityofchicago.org.